Appavisc is a viscoelastic solution of optimum viscosity It contains highly purified grade of HPMC 2% w/v. It is clear isotonic sterile, non inflammatory used as a lubricant and protector in IOL surgery. Simple to remove from the anterior chamber. Primary packing - 2 & 3 mL plastic syringes, plunger stopper, plunger rod & pouch. Secondary Packing - Carton box with 23G Sterile Cannula. 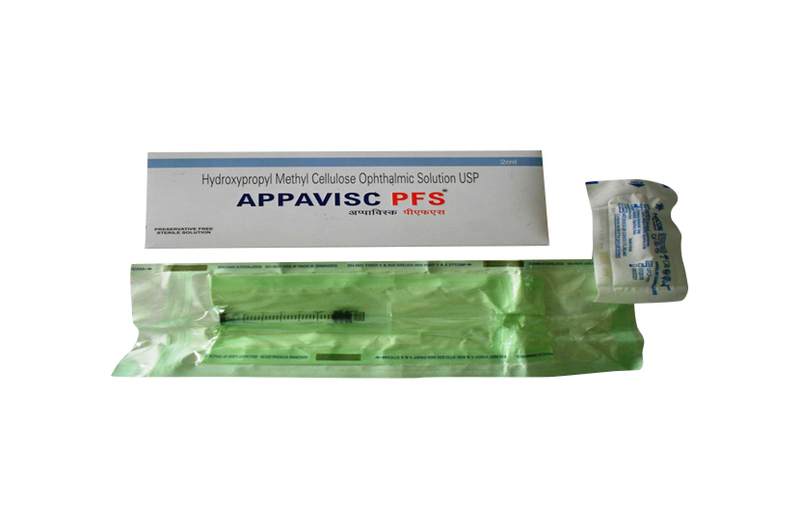 Appavisc  PFS - 2 mL and 3 mL pre-filled plastic syringe in double pouch. As a surgical aid (Medical device) during cataract surgery. Maintains the depth of the anterior chamber without the risk of the damaging the endothelium of the cornea or other intra-ocular tissues. Contraindicated in patients with known history hypersensitivity to its ingredients. Appavisc-PFS 2%w/v injection is used to relieve burning, irritation and discomfort of dry eye conditions associated with-deficient tear production, infrequent blinking, smoke, wind, pollution, extended use of computer screen or television, medical treatment, dry atmospheric conditions (air-conditioning, central heating). It may also be used to aid insertion of hard contact lenses and increase comfort during wear. It is also indicated to aid certain eye examinations and surgeries. Appavisc-PFS 2%w/v injection belongs to a class of medicines called eye lubricants or artificial tears. It reduces dryness and irritation by wetting and lubricating the surface of eye. Available in 2mL & 3mL Sterile pre-filled syringes & 23 Gauge Cannula. one syringe & 23 Gauge cannula packed with double pouch printed labelled & carton and carton packed in corrugated box.